I won’t start this week by grumbling about the Most Ridiculous Time Change that we call Daylight Savings Time. Some day, reason will prevail and it will be abolished altogether, don’t you think? So, instead of bemoaning DST, I’ll start the week off sharing a tiny bit of progress on Late Harvest. I Really Like this leafy element that I stitched over the weekend. At first, I wasn’t sure I’d like the color combo, but I love the techniques involved. The strange thing about the colors, though, is that, as the element came together, the colors seemed to morph into something rather pleasing. I really wanted to finish this whole stumpwork cluster of three leaves over the weekend, but alas, it didn’t happen! Are you ever surprised how long it takes to stitch something that’s relatively small? I am! The lattice leaf in the photo above took me just over four hours to embroider, and it’s smaller than my index finger! I’m not sure if that says something about my slowness in stitching, or about the intricacy of the particular element, or about the whole nature of hand embroidery. In any case, I thought I could finish the three leaf cluster with no problem, but I was duped. This particular leaf uses the same technique found in this larger leaf that I showed you a while ago. It’s a long and short stitch base, topped with a lattice grid, topped with a beaded vein down the middle. My beaded vein leaves a bit to be desired. It has a bit of a wobble to it, doesn’t it? Funny how I only notice those things when I see close-up photos! 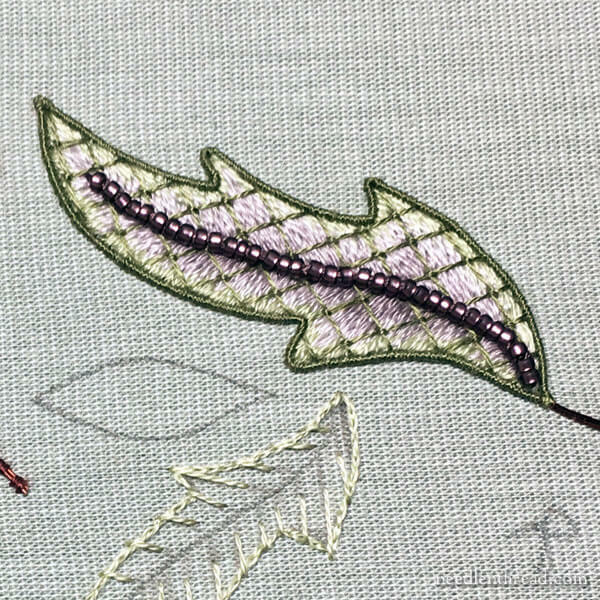 Anyway, once the leaf is embroidered, a wired outline is worked around it using an overcast stitch (like a tiny satin stitch) over the wire, right along the edge of the leaf. The Really Weird Thing about this particular leaf is the color combination. Wait. Let me re-phrase that! The Really Weird Thing about this particular leaf was my first perception of the color combination. The outer edge of the long and short stitch is a very pale, soft green (3013 in DMC). But when I combined the two inside shades (DMC 452 and 451) with that light green, the color transformed before my eyes. The purple tones in the grayish threads took over, and the leaf ended up being a really pretty combination of pale green and soft purples. And I liked it! A lot! I love the trellis over the long and short stitch, too. It adds such a pretty touch! Yep. I have to say, Hazel Blomkamp’s color combinations and stitch combinations are absolutely fascinating – which is undoubtedly why I love working this kit! This week, I’m planning to make tons of headway on Late Harvest! I might even finish it. To eliminate a 200-mile drive every day to my treatment center, I’ll be staying in Kansas City with Late Harvest as my sole companion for the last week and a half of radiation treatments. Trust me, this is a good thing. The daily drive was a bit much. I really have to shout out a huge Thank You! to all who took advantage of the Spring Sale on Needle ‘n Thread this past weekend. It’s thanks to you – and to all who have bought my ebooks over the years, really! – that I can justify staying in the city for eight days, and I can’t thank you enough for it! I hope you enjoy the e-books. And speaking of the Spring Sale, I had a lot of requests to extend it past the 15th of the month and several requests to add some other e-books to it, especially the Lattice Jumble Guide and the Marian Medallion e-book. So I’ve done that for you – all my larger e-books are on sale now, and the sale will continue through the end of this week for those who wanted that extra little break. I’m not abandoning you altogether, even though I’ll be out of town. I have to show you my set-up for stitching in a hotel room. It’s rather weird, but it works. I hope you have a glorious day, wherever you are, and that the sun, even though it’s rising an hour later every day (rrrrrrrgh), shines on you all week long! Every day I read your blog. I am always amazed at your beautiful work. But, hands down, I think Late Harvest is your most beautiful project. I just find this piece breath taking. Thank you for bringing it to life and breaking it down for me. Your leaf is gorgeous Mary! How many of us would have even noticed if you hadn’t called it to our attention? If your friends find glitches in your needlework, you need new friends! LOL. Nevertheless if you want to “fix”, have you tried gently rolling each bead individually in place? Sort of like “petting” a bullion? Sometimes they will adjust & reseat themselves. If that doesn’t work & the bead alignment still bothers you in a few days, you might try stitching one long stitch thru the entire line of beads. 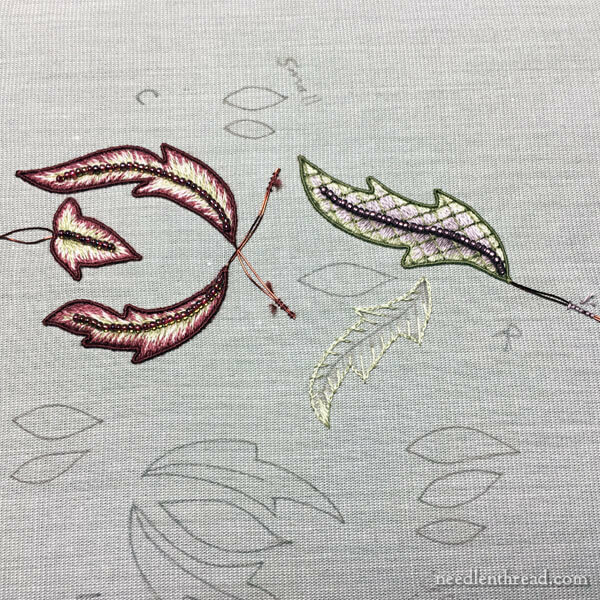 Since the L&S & couching are so beautifully done, you could try this on a doodle cloth first to see if an additional strand of silk or a strand of beading thread would do the trick. Best wishes with the project whatever you decide. We change the clocks in the UK, too. I wouldn’t mind if abandoning the practice as long as we do it after putting the clocks forwards in Spring but then we would be permanently on British Summer Time rather than Greenwich Mean Time which might be a bit wierd! The leaf is great. I’m sure the beads look fine when not magnified but if you can run one long stitch through all of the beads (or even two) that may straighten out any wobbles for you. Not doing that drive every day sounds like a good idea to me, if only because it gives you more stitching time and we will keep you virtual company while you’re in your hotel room. Best wishes to you. I love that leaf, Mary. I’m often surprised at how long it takes me to complete something, and I have to remind myself. “One stitch at a time”. That’s how all of these beautiful things you make come together. I know what you mean about the time change, in the UK the clocks change on the last Sunday of March. The Late Harvest is so beautiful and you have made great headway with it and the colours are lovely in the lattice leaf with the wired outline. I’m really glad the sale of the e-books was able to finance your stay in Kansas City, I wish you well with the radiation treatment and hope and pray for you at this difficult time. I can’t wait to see your set up in the hotel room. God Bless you Mary. Your work on Late Harvest is lovely. I’d like to order your lattice sampler e-book, but have a question first. Can I use dmc threads for it or is it wool thread? Thanks. So happy to hear that you are nearing the end of the treatments Mary – one more hurtle to get over. And I’m with you on the daylight savings thing – why on earth is it even thought of anymore. Especially the overcast stitch – do you have any tips on that? I´m planning a project where I have to “frame” a lot of pieces with it, but I can´t get it even enough, after a (very!) short time it all crumbles up and looks really bad. My fabric has a lower thead count than yours, but that can´t be that big a deal, can it? All my best wishes for your recovery, and thank you for all you are doing, you are amazing! Glad to hear you’re going to stay in town rather than make that drive every day. Was a bit worried about that…I hope you’re asking for help when it’s needed and accepting it when it’s offered. Please don’t push yourself. The purple and green is a gorgeous color combination, by the way. Reminds me of my mother’s purple irises bobbing about on their green stems! Sometimes color combinations really work, despite what the threads look individually or before the whole section is complete. I did Teresa Wentzler’s “The Castle” and the colors for the rocks were mainly purple-ish shades…the rocks in the model looked grey/brown and I thought I was going to end up with purple rocks! But the combinations of purples/greys with green highlights (bushes between rocks) made the rocks brownish-grey. Or on TW’s fruit bellpull, there’s color combinations that turn a bunch of yellows and reddish-pinks into a peach. Some designers you learn really know their color palate, and it sounds like Hazel is one of them. Those color combinations are really gorgeous! I love the purple and green mixture, and I hope the beads turn out to be straighter from a distance. Good luck with the last of the treatments. I’m sure they take quite a toll on you. Now you can listen to your books while stitching in the hotel room, and not have to rewind every time a big truck passes you and drowns out the book. I’d love to see your set up in the hotel. I’ve done quite a bit of sewing in hotel rooms over the years when I traveled a lot for work. As for the beads – if I knew how to keep them perfectly in line, I’d make a million dollars. LOL I love beads and carefully tweak them into position. But the least brush of a hand or bend of fabric and they go a-wandering. I do keep the tension tight and I do stitch through and around the bead. But they’re ornery. I love the idea of the “last week and a half of radiation.” It’s almost over. You are in my heart daily. I hope all your beautiful threads have helped hold you together. That hotel room sounds like a wise choice – I’d been worried about you getting too tired with that long drive. You need your strength! Now to the important questions. Does the hotel room have good strong light? And a good chair to sit and stitch in? Or have you had to bring your own? The leaves are gorgeous, of course! Anything you touch is gorgeous. I hate daylight savings time. Grump. But I love the progress you are making. I was thinking about your drive and wishing you didn’t have to do it. Watching all the leaves get finished makes me want to take chances with my leaf colors. I’m usually a bright green girl, but purple and red are just calling my name after this. You have been in my thoughts and prayers since you started the long road to recovery. 200 miles each day can start to wear on a person after awhile. I love your new embroidery project. Like all your work, it is beyond beautiful. Those of us who read your blog each day are indeed lucky to have you. I join you in disliking changing the time twice a year. Does it really have a useful purpose. Good luck with your treatments. Mary I have a confession: I did not avail myself of your sale last week. The reason is simple, I already have both those books. But now that you have added the Marian project I may just be tempted. I rather like daylight savings. I admit the first couple of weeks after each change are a bit of a trial as we get used to it, but then it is quite good. The longer hours of daylight after dinner in the evenings are useful for the gardening chores that the ‘daytime’ temperatures were too high to allow. Some of the reasons put forward by the ‘anti’ brigade in this country were too ludicrous for words, eg, the curtains would fade more quickly and the cows would stop producing milk. Still as Victor Hugo is reputed to have said, I disagree with what you say but I will defend to the death your right to say it. I hope your time in the Big City yields great results, both in your health and the progress of Late Harvest. Good luck. You probably already know this but … the trick wirh a line of bead embroidery is to run your needle and thread back through the whole line of beads after you finish. If you’re using beading thread or larger beads you may need to do it a few times. This tightens up the line of beads and removes wobbles and gaps quite nicely. I’m with you on the time change. I’m still groggy from having my sleep times messed up. I’m going to have to pull out those two colors of my DMC floss to see the one changed to such an awesome color. I do wonder how the designers of these projects are so good at picking colors. Is it trial and error or just an innate sense of color? You did a fantastic job on the project so far and thanks for all the teaching that you do here. so glad you are almost done with radiation – this is the hardest part, but there is light at the end of the tunnel. The color combination is amazing! The leaf looks exquisite! 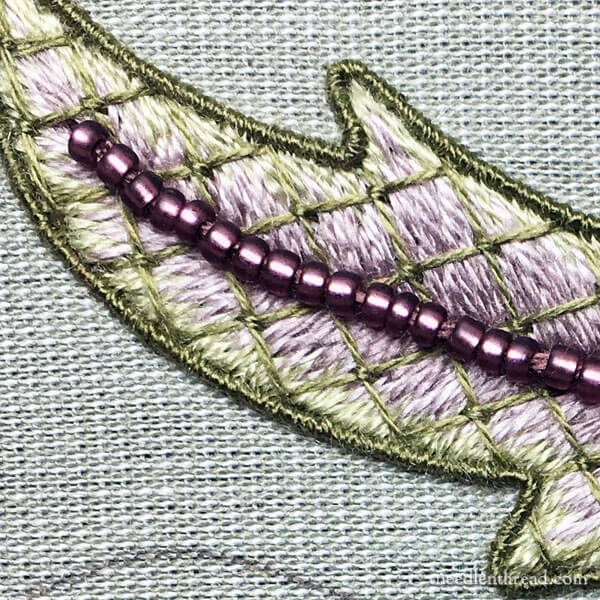 the bead line looks fine to me – but if it really bothers you, passing the needle and thread through the line of beads will make them look more as a straight line. Looking forward seeing the whole project done! Enjoy your stay in KC. Am delighted that your book sale went so well and that you are able to treat yourself to eight days in Kansas City. It is a break from driving, a change of scene and a holiday for most of the time but which still includes stitching. Enjoy. Hello, I was in looking at my pinned alphabet samplers and came across your letter “Y”. I’m checking to see if you have any updates. Love the intricate stitches, colors and your designs. Do you have instructions for the complete alphabet and numbers? Hi, Teresa! That comes from Stitch Sampler Alphabet, which you can find here: http://shop.needlenthread.com/product/stitch-sampler-alphabet Thanks for asking! Next Next post: Mellerstain Firescreen Winners!